^Same. Well, not woman, but man. Omg, I'm dying, those photographs are gorgeous and kick my fanboyship in overdrive. I was wondering though, why is she letting herself get photographed like that? It seems a bit extreme for her taste? Has she been reading all over the webs how people WANT her to play the sax? Is she mocking us in some clever artistisc way? AAAAH! so exciting. those photos are amazing. She looks like she's having fun! Many PJ Harvey fans who rushed to buy tickets from Somerset House's online store on Friday were left bitterly disappointed, after the website buckled under demand. It was announced yesterday that the two-time Mercury Prize winner would be collaborating on a live installation in London with Somerset House on the artist's Recording in Progress project, which runs from 16 January. However, it quickly became clear to fans – who hoped to see PJ Harvey recording her new album at the arts centre – that there would be a long wait to try to secure tickets. Infuriatingly, many reported being locked out by a slender five-minute window in which Somerset House had offered customers to successfully book the tickets. But, due to the website struggling to cope, the painfully slow loading time for each page of the purchasing process meant that fans were forced to repeatedly attempt to buy the tickets. Some reported on Twitter that they had got all the way to the checkout on a number of attempts, only to be told their basket was empty, after hours of patiently waiting for the system to come back to life. Somerset House eventually apologised to customers via its Twitter account, after complaints stacked up. The Register asked Somerset House to explain why its servers had failed to cope with the demand. We’d taken advice from our server providers regarding anticipating demand on our website and had increased the bandwidth accordingly. We had already sold approximately 70 per cent of the allocation of tickets when the website started to experience problems. We had a situation where our CPU utilisation was maxed out, this means that the server was receiving it's maximum CPU allocation from the host server but due to the high level of traffic being received the server was unable to cope. This was resolved increasing the resources available to the miniserver. We quizzed Somerset House on why it hadn't foresee the popularity of such an event. And we wanted to know why the organisation hadn't considered farming out the ticket purchases to a third party provider. Who could have possibly anticipated high CPU load. I didn't get a ticket as didn't know anything about it until it was all over. Hopefully no one is there for the drum sound checking as that is, in my opinion, the most tedious part of an album recording session. There's other tedious bits, like edits and tiny tweaks being done over and over to fix some tiny thing you can barely hear. But the warning that you might be unlucky and not actually hear much music is a good warning to be aware of. Or you might strike lucky and catch a full session of takes that are more like the songs being captured. That's a good thing to keep in mind. Personally, I'm not expecting a performance of any kind. In some ways I just hope I see something that I wouldn't have expected to be part of the album-making process. I know about the obvious parts like recording and editing, but I'm sure there are loads of tiny details that I haven't even thought of, and I'd love to have a gander at what goes on. It may change the way I listen to some of my favourite music, who knows? "On arriving visitors are ushered down a corridor to the viewing space. It's voyeuristic and thrilling at the same time. Dressed in black, the sapling-thin, 45-year-old Harvey looks porcelain-skinned and elvish up close, busy and deep in thought, unfazed by this new location that casts the mind back to the original Big Brother set. "Producer Flood sits on a sofa, discussing the best way to achieve a sound with an engineer. Vintage wooden instruments, drums and a shiny trombone sit on stands beneath a sort of Harvey family crest that has been daubed on the wall. "Hung around the viewing space, amid towering Bowers & Wilkins speakers that pump the music, the coughs, the deliberations of the artists to the audience, are the lyrics to the songs that will be recorded. Spidery handwriting and crossed-out workings give clues to the new album's themes, with titles like 'Homo Sappy Blues' and 'Imagine This'." !!!!!!!!!!!!! So we already have two song titles: "Homo Sappy Blues" (sappy homo sapien? haha) and "Imagine This." And I'm loving the sound of vintage wooden instruments and trombones. This is all very, very exciting. *EDIT* Here is the full review. Last edited by Bruce; 01-16-2015 at 04:23 PM. Oh to be a spectator - it sounds fascinating. 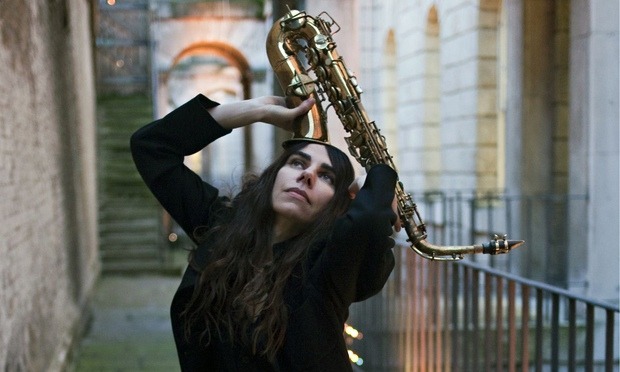 PJ Harvey wowed audiences at London’s Somerset House, and yet she hardly opened her mouth. Earlier this month Harvey sold tickets to allow fans to watch the recording of her ninth album, and the first visitors yesterday proclaimed the Recording in Process “performance art” piece a success, even if they saw little of her singing. Harvey and her band set up camp in the former Inland Revenue staff gym and rifle range on Monday. On Friday the first ticket holders were ushered in to view the recording process. After surrendering their mobile phones, a group of about 30 wound their way down through Somerset House’s labyrinthine corridors into the basement. There they found a specially commissioned studio, with soundproof glass the musicians can not see through. The viewers are bathed in an eerie half-light, contrasting with the harsh, clinical lighting inside, and can watch the musicians from two sides of the studio. Eight people – Harvey, three session musicians, producer Flood (aka Mark Ellis) and three sound engineers – were in the studio when the group entered. Looking oblivious to anyone outside, Harvey sat in the middle of the room with headphones on, nodding her head to the music. When Harvey herself spoke or briefly played the violin – which was rare during the 45 minutes – the group fell into a hushed silence. But it was violinist James Johnson who was the focus of the studio rather than Harvey herself. As the vocals to a chorus looped, he played along, stopping, and then returning again and again. The track was called “All the Memorials to Vietnam and Lincoln”, which chronicles a trip the musician made to Washington. Sheets with the lyrics to this and nine other songs were mounted on the wall for visitors to see, with names including “Sight-Seeing”, “South of the River”, “The Chain of Keys” and “Around Your Eyes” – all heavily annotated by Harvey and dated to 2012. Michael Morris, the co-director of Artangel which worked with Harvey on the project, was wandering among those on the first public visit. He added: “I was also not expecting this strange intimacy. You’re very close but they are not aware of it. "Near The Memorials to Vietnam and Lincoln"
I was initially guessing that further recording might take place after Recording in Progress, as 1 month didn't seem like sufficient time to record an album (even with the earlier recording time mentioned in one of these articles). But then I remembered LES was recorded in 5 weeks in Eype, so I guess it's entirely possible. Recording for LES wrapped up in May of 2010, and was released in February of 2011. Hopefully we won't have to wait quite as long for this album. I'm very curious to hear personal accounts of Recording in Progress from some of the unforumzers attending!